Dr Ijaz Rasool Noorka has broad interests in the development of productive and sustainable agriculture for Pakistan and developing countries. His interests complement those of the Molecular Cytogenetics Group, and have enabled us to extend our consideration of the outcomes and impact of our work on exploitation of biodiversity by chromosome engineering. Ijaz has been a Visiting Research Fellow in the University of Leicester for a year ending in May 2013, holding a highly competitive and prestigious fellowship from the Higher Education Commission, Islamabad, Pakistan. While in Leicester, his practical work included a range of molecular and cytogenetics approaches with wheat, maize and linseed: measuring diversity using IRAP and other markers in Pakistani and control accessions, crossing wheat lines, and in situ hybridization. He was involved in many discussions and the development of concepts and projects related to sustainable agriculture, bringing a wide range of insight into the challenges facing agriculture and food production worldwide. What are the genetic requirements of crops now and in the future to meet the need for more food without trashing the planet? How do we address the challenges of increasing food production in the face of reducing water availability for agriculture and climate change or instability? He was tremendously productive during his Fellowship in completing and publishing many manuscripts based on previous research and on new thoughts and research carried out, and making two visits to the Kingdom of Saudi Arabia with including a high-profile presentation for World Water Day in March, along with other useful visits and conferences. At the University of Sargodha, Pakistan, Assistant Professor Ijaz Noorka is growing trials of various species, in particular wheats, and working with water management projects integrated with genetic resources. 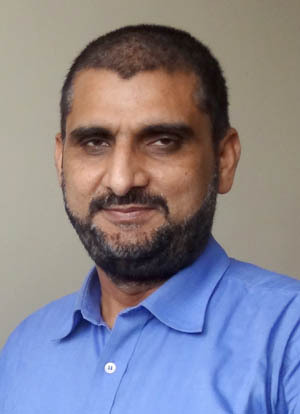 He combines his research and teaching with being Editor of the International Journal of Agriculture and Applied Sciences (IJAAS), Secretary General, Pakistan Agricultural Scientist Society (PASS), and President of the World Forum on Climate Change, Agriculture and Food Security (WFCCAFS). Previously, he served at the On-Farm Water Management Wing, Department of Agriculture, Government of the Punjab, Pakistan for World Bank, Asian Development Bank Funded Projects. He has delivered International lectures and presented research papers at International conferences at Egypt, China, Morocco, South Africa, Iran, Abu Dhabi, Japan, Sudan, Kuwait, India, Malaysia, France, Italy, Singapore, UK, Dubai, Turkey and Kingdom of Saudi Arabia. As well as more than 60 academic publications in Journals, Ijaz has published over 100 articles in Agricultural magazines, newspapers, and through agricultural awareness campaigns at Radio and TV shows. At the farewell party in Leicester, Dr Noorka noted that he wants to divert his attention towards the improvement and upgrading of Pakistani agriculture and the rural people’s life: to extract all of his experience from field, laser levelling and water course improvement to wide hybridization, new germplasm, molecular markers and fluorescent in situ hybridization, translating to increase the poor people farm income. He also noted Pat Heslop-Harrison’s kindness and international exposure, Dr Trude Schwarzacher’s guidance, and discussions with other groups including Professor David Twell with gene transformation techniques and Prof Sir Alec Jeffery with expert discussions and seminars, as well as the University facilities, extra-curricular activities and Leicester life in a beautiful atmosphere. Pat Heslop-Harrison discussed the commitment of his laboratory to the Millennium Development Goals (MDG), and particularly how the use of biodiversity has both short and long term impacts on 1, eradicating extreme poverty and hunger; 7, ensuring environmental sustainability; and 8, building a global partnership for development (and our work can impact on the remaining goals by improving livelihoods and health). We look forward to ongoing and productive collaborations. This entry was posted in Collaborators, Sustainability and tagged agriculture, breeding, chromosomes, crops, cytogenetics, Faisalabad, food, food security, hybrids, linseed, pakistan, plants, water, wheat. Bookmark the permalink.